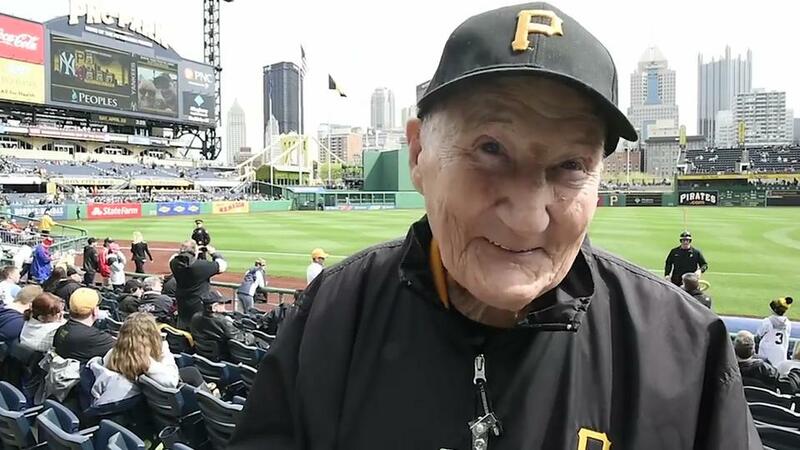 On April 27th, 2018 Phil Coyne celebrated his 100th birthday at a place he knows very well, PNC Park. Coyne who for 81 years worked as an usher for the Pittsburgh Pirates at Forbes Field, Three Rivers Stadium and their current home of PNC Park. The Pittsburgh Pirates honored Coyne before their game against the St Louis Cardinals on Friday. They dedicated a plague to him in the sections (26 & 27) where he worked at PNC Park since it opened in 2001. Phil retired before this season’s Opening Day just shy of his 100th birthday. He had a celebrity status with Pirate fans. Fans often asked for his autograph and took photos with them while attending Pirate home games. He was given hugs and kisses by those fans who sat in and around his sections. He was a staple to the fans who sat on the third base side. Last season the Pirates helped celebrate his 99th birthday presenting him with a personalized #99 jersey along with the Pittsburgh City Council declaring April 27th, 2017 Official Phil Coyne day. The Pirates estimate that he attended roughly 6000 games during his time of employment only taking time off to serve in World War II. For somebody like me who likes to talk baseball Phil Coyne is the Holy Grail of the sport. It’s almost impossible to comprehend all that he’s been able to witness on the field. He’s been able to see historic moments like Babe Ruth hitting a home run to Bill Mazeroski‘s home run in Game 7 of the 1960 World Series. Think about how amazing that is. Coyne began ushering in 1936 which is the same year that the Baseball Hall of Fame inducted its first members. On Friday night the Pirates gave him a memorable gift with their games ending. Down 5-2 to the St Louis Cardinals entering the bottom of the 9th the Pirates offense generated 2 runs to tie the game. Then in the bottom of the 11th Sterling Marte’s walk off single secured a Pirate victory. Phil Coyne and his family were still in the stands to witness a Buc win for his 100th birthday.